I wish to convey my appreciation for the attention that Mark in service provided me with today. I brought my Fit in for the airbag recall plus an oil change. After the previous oil change, there was a rattle that wasn’t resolved (my Fit sounded like a MUCH larger vehicle when the fan was on 3 or 4) but as I was busy and tend to procrastinate I just turned up my radio. When I booked the oil change I requested that the rattle be investigated. Mark thought he had solved the problem before I left, but the rattle was still there. I returned and Christina had Mark come out to check. He fixed the problem (two acorns ?!? behind the filter in the dash) right in the parking lot. This **IS** Jason Armstrong Honda service PLUS. Thank you for your great staff. I just wanted to send you both a note to thank you for all the work you did to find me a new car after mine was written off. Your attentiveness to my situation and time constraints was incredible and I really appreciate the effort you put in to find me a replacement. I am writing in appreciation of Rob Taylor, one of your salesmen at Huntsville Honda. People are often quick to complain about problems, yet slow to acknowledge excellent work. Rob was excellent in every way.I just purchased a vehicle from Rob and in 45 (!) years of buying cars I have never met such a good salesman. He literally went the extra mile – he brought the car a considerable distance so that we could test drive it where we were staying.His enthusiasm for the vehicle I eventually bought was definitely contagious. However, he earned my respect by never bluffing, and honestly admitting when he didn’t know the answer to every difficult technical question.When I vacillated about the car, he offered to hold it for me for a short time in return for a $500 deposit. When he told me that the deposit could be refundable if I decided not to purchase it, that clinched the deal for me.When my wife and I came to your dealership two days later, he was quick to spot a serious hole that we hadn’t noticed in the sidewall of the tire of our vehicle. In doing so he quite possibly saved us from a blowout when on the highway. He then bent over backwards to give us a loaner car while we left our vehicle at your dealership to have two tires replaced. Although we were staying far away and weren’t able to return for two more days, he allowed us the loaner car for the extra time.He was always personable without being ingratiating. Without being asked he cheerfully began helping us to transfer a big carful of camping luggage.I would have no hesitation in recommending Rob to any friend looking to purchase a car. You are fortunate to have a man of his caliber on your staff. I would like to thank you, Mark and Rob for excellent customer service. On Friday July 31st, we arrived in Huntsville from Kemptville for a camping trip. We stopped for a break and I noticed antifreeze on the ground. I looked up garages from my GPS and we went to 2 garages and nobody was willing to help us. We were pretty discouraged as basically the garages “slammed the door” on us and were not willing to help. We continued on as we did not want to be stranded if it was a major issue. We stopped in at Honda (even though my van is a VW) and asked if someone could look at it. John, you were our knight in shining armour; you met us with friendly positive manner. You said no problem; we will get Mark to look it at as he has European vehicle expertise (he also owns an old VW van). You also told us that there is a dog water dish inside (we had our small dog with us) and a lounge area. From the lady inside at the front desk to Rob who brought the van in and carefully put it on the hoist, Mark the mechanic who checked it out, we were treated with professionalism and a friendly positive attitude from all the Honda staff. All our questions were answered; you even tried to locate a part. We were reassured and we continued on our trip. We are very thankful that we stopped in at Honda; we were treated professionally and efficiently. Please accept my gratitude toward you and your staff for speedy, efficient, customer focused service.You have an awesome team! I’d like to express my gratitude to your service department. I was headed home to the Kitchener/Waterloo area yesterday and when I started my Pilot, the ABS light and the VTM-4 light came on. I stopped in at your dealership, expecting to sit in your waiting area for most of the day, however, within 15 minutes your service department had me back on the road again with an ease of mind. I am very grateful and very impressed with their friendliness, their quick service and their professionalism. I’ll be sure to sing your praises to anyone that will listen. 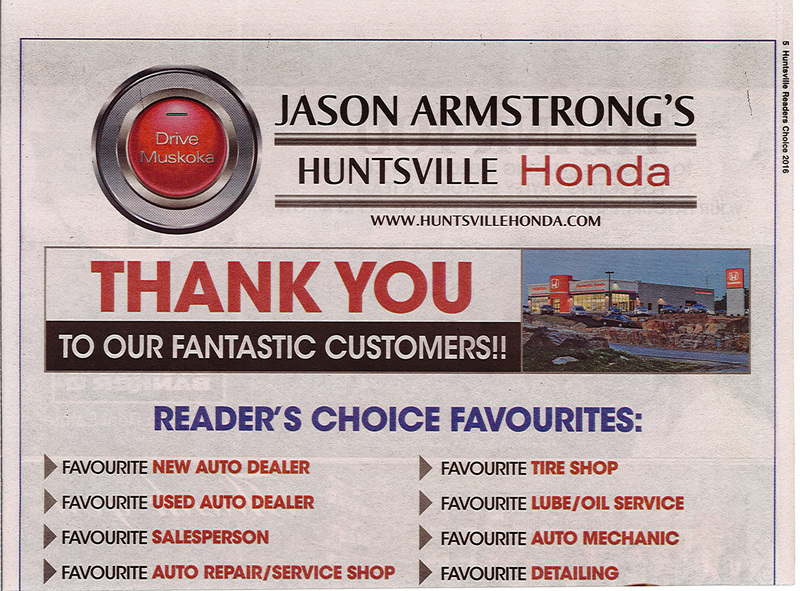 Can’t say enough about the team that is at Huntsville Honda! Darwin, Sam, Thank you so much for the service provided in buying our 2012 CRV. Had one question and it was answered hope i did not offend anyone because that was not the intention by any means! Came in for OLF and Darwin helped me again in setting up the cell phone/blue tooth compatible for hands free use. All with a smile and ” If you need anymore help with the vehicle stop or call me i will do what i can”The service team as well, can’t remember the names but thanks to them as well!! Yes it is the 7th piece of Honda equipment that we own! I’m writing this from a cottage where there is always a shortage of decent note paper. So be it. Yesterday, I had the pleasant experience of visiting your Honda dealership to repair my wiper blades. Your staff were truly outstanding. From the advisor Christina, to the Technician Chris, to the woman in the waiting area, and all the others working there, it was a delight. Their natural friendliness, efficiency, and genuine caring was a treat. Thank you and all of them for setting such a high standard. I just wanted to take a moment to thank you and your staff for going the extra mile (and a long mile it was) in order to see that my Honda was well and properly cared for. You really do run a first rate operation! From M.C., service customer at Huntsville Honda. April 14, 2014Customer’s Explanation: Another shop did not complete necessary work, Billy from Huntsville Honda looked over the previous work orders and helped get my car to where it should safely be. Customer’s Explanation: Billy really worked with me which is something, coming from Toronto, I am not used to. I had been to a few shops across the GTA searching for great service but I found it in Huntsville and Billy was a huge part of that. I would just like to take a moment to thank you for your service on Saturday. My wife R. and I visited Huntsville Honda to inquire about an ‘as-is’ vehicle that was listed online. Based on our modest budget, we knew that it would be a challenge to find a reliable vehicle and further assumed that purchasing from a dealership would be impossible. We were extremely delighted to have been proven wrong. 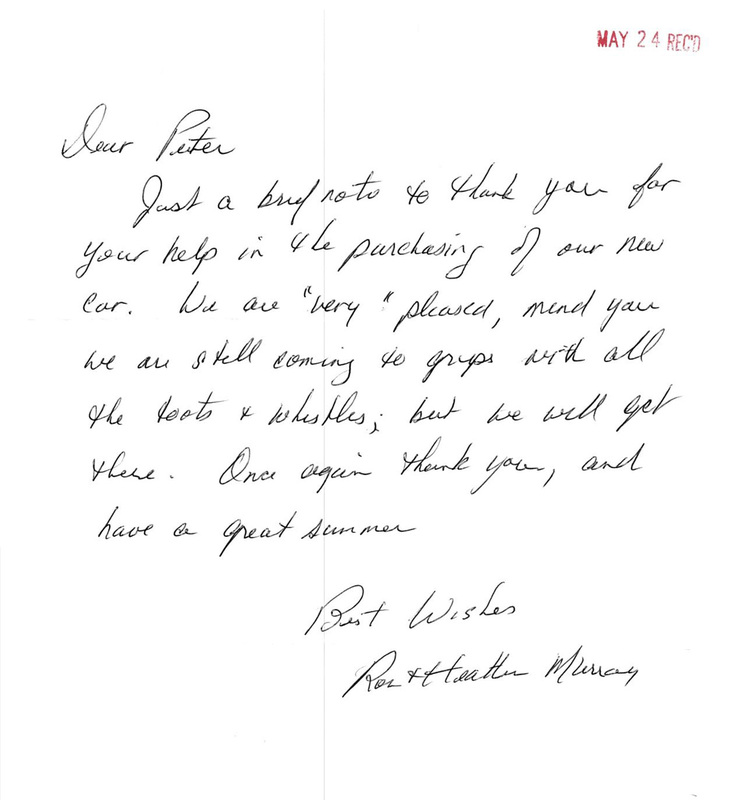 From phone call to purchase, we were absolutely thrilled with the service that you provided to us. Even with our lower than average budget, you took the time to make sure that you found the best vehicle that you could for us – and helped us join the Honda ‘family’. Your attention to detail in explaining the vehicle and associating it to our lifestyle made us incredibly comfortable yet excited. Your commitment to value to us as customers far exceeded our expectations. We will not think twice about calling you when it is time to replace our Taurus! Thank you again for an amazing experience. We can’t wait to get behind the wheel of our new-to-us Accord! My wife MS and I purchased a new 2014 Honda EXL Pilot from Mr. Sean Morrison of Huntsville Honda. 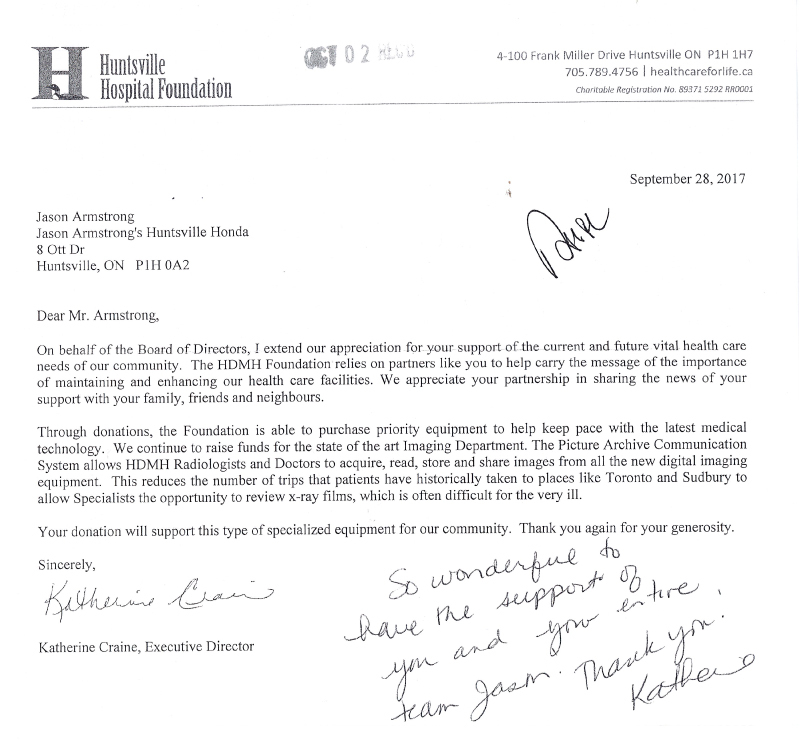 This letter is being written regarding the experience we had working with Sean from the initial cold call to the final closing. During our initial calls and Emails Sean was always clear, concise and responded in a very time sensitive manner and always relayed his information and answers to our questions thoroughly. In person Sean demonstrated “exceptional” listening skills and his product knowledge was superb. At no time did we feel that Sean exerted any “pressure tactics” and he was always comfortable, approachable and transparent. Due to Sean’s professional mannerisms and fantastic relationship building, in a non-pressured manner, he converted us from a Toyota loyal family to a Honda brand customer. This was no easy feat, but due to his communications skills and development of a trusting relationship we decided to buy the Pilot from Sean. I do not feel that such “Value Added Service” on the front lines should go unrecognized or unrewarded. If it were not for Sean as our sales representative, we would not be new Honda owners. At this moment we are considering buying another Honda vehicle not only for me, but my son as well in the future. When we do decide to move forward on this, we will most definitely be calling on Sean to finalize these deals. 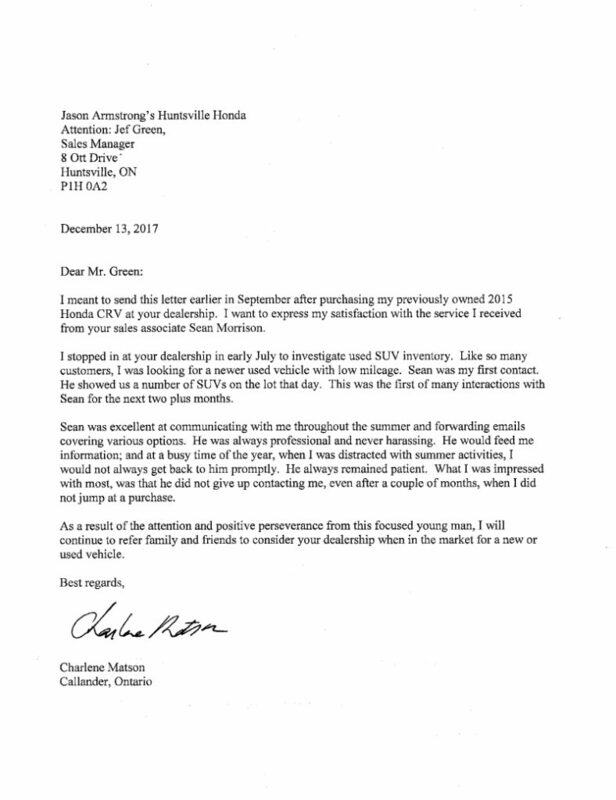 It is my hope that Sean will be recognized & rewarded for his commendable front line service that he provided us as he conducted himself in such a professional manner as an ambassador of Honda Canada. Such an asset would be difficult to replace and was a pleasure to deal with. It is our hope that this letter can be forwarded up-line to regional, provincial and national supervisors on Sean’s behalf. Thanks for your assistance in this purchase. I will have no problem referring anyone I can to you in the future. Buying from you was a very pleasurable experience. You facilitated a very customer friendly and respectful experience. Please keep me on your contact list for the future. I have recently purchased a used truck from your dealership. The service and attention I received was exemplary. 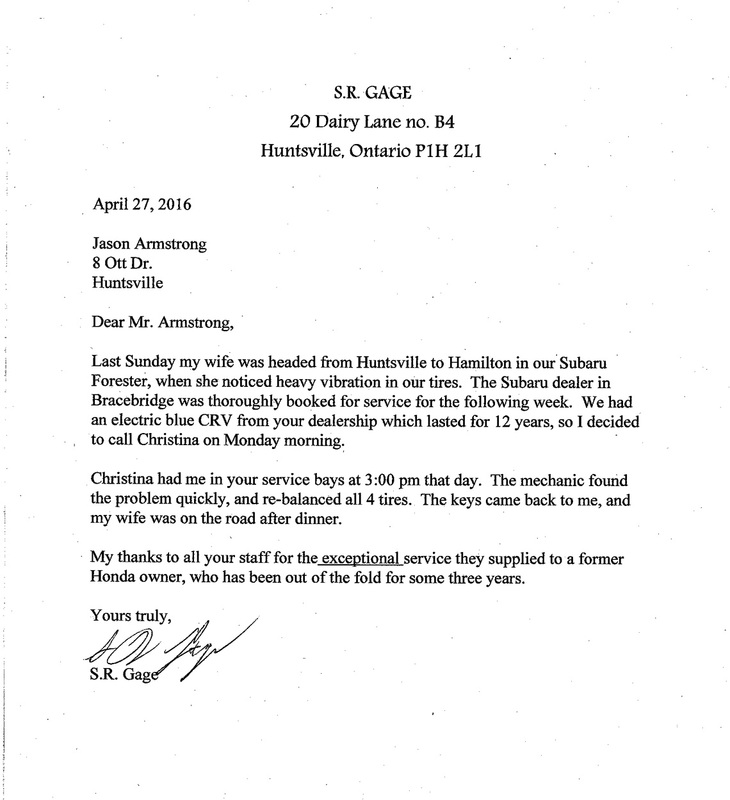 I have purchased many vehicles over the years and this experience was with taking the time to comment on. I would also like to commend you on your facilities. Obviously you have made customer service/satisfaction a priority. It is a pleasure to serve, with you, in our great community. Thank you for your profoundly generous contribution. Just wanted to say Thanks for the great customer service today. From start to finish it was perfect and a really great experience. My Honda looks amazing with the rims! You truly have a great team and it showed today. Dianna states that everytime she is in the service department she is treated very well. She loves the service department and everyone in it.